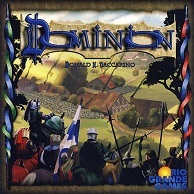 Dominion is a card game designed by Donald X. Vaccarino that was published in 2008 by Rio Grande Games. The original card game has received several awards and accolades by the hobbyist gaming community and is recognized as the first deck-building game and the originator of that entire genre of games. The game was initially ported to the digital format in a web version by now defunct Goko Games but has since been taken over by Making Fun Inc. While the original web version still exists entitled Dominion Online, the game has since been ported to mobile platforms and updated clients for PC, Mac and Linux have been released on the Play Dominion site. The game has also completed the Steam Greenlight process and will be released there as well. Any expansions purchased previously in the web based Dominion Online carry over to all other platforms and all clients can play together utilizing cross-platform multiplayer. Dominion is themed around building up your small kingdom. 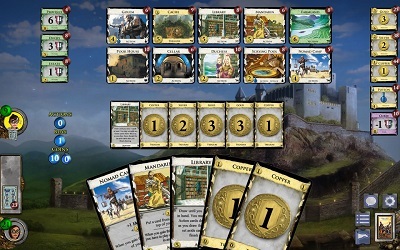 At the start of each game, 10 piles of kingdom cards are selected from the set of 500 cards included with the base game and are put in the center of the board, these constitute the "trade row". In typical deck building fashion, players all begin with the same set of basic cards that are played to generate money with which they can purchase cards from the trade row. 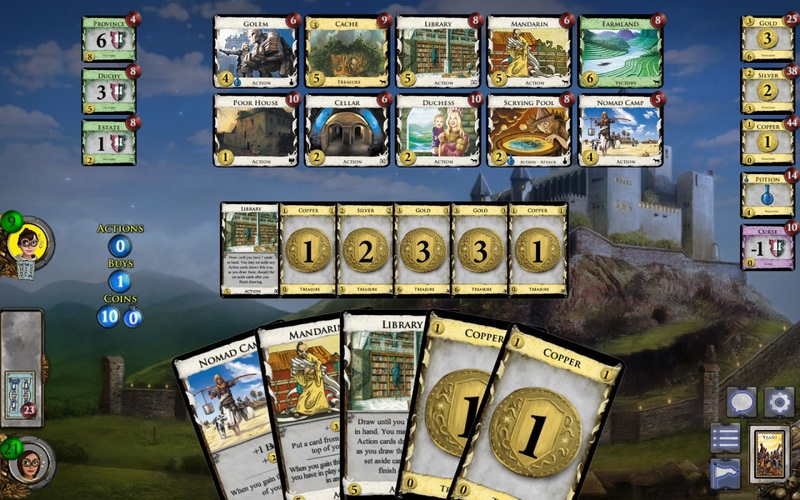 Purchased cards are added to the players deck and are later drawn and played for various effects and to generate victory points that are used to win the game. The digital implementation is free to play and includes the base set, interactive instructional tutorials, as well as single player campaigns and the ability to play multiplayer with up to four people. Several expansions that have been brought over from the original card game that are available as in-app purchases. These expansions add many new kingdom cards to the game and can be played together in any combination with or without the base set cards, making almost infinite possibilities for game variation and replay-ability.